Star of Casualty 1909 and Little Dorrit, Anton Lesser, has lent his voice to a radio play based in Bristol. RADA-trained Anton plays painter and decorator, and graffiti artist Trevor in The Gert Lush, a radio drama written and produced by Rebecca Goff. Rebecca is a member of a writers' collective in the city. Rebecca says her inspiration for the play came after a "chance meeting" with two women who were upset about the closure of their local art gallery. The play is about a doctor's receptionist, Shirley Wainwright, whose dream is to be a full-time artist with space to exhibit her fantasy art. The play sees Shirley eventually take on the lease of a former art gallery in central Bristol, which she calls The Gert Lush. Writer and producer Rebecca Goff said: "I don't know the details of what happened but the gallery is still thriving. "[Another] source of inspiration was provided by my mum who attends art classes, which seems a fruitful source of comedy." Rebecca added: "I think it is this fundamental need to be creative and to express ourselves that drives many people, including Shirley, whether it's creating pieces of art, writing, filmmaking, decorating cakes, or making music. "It fulfils a need in many of us and makes us feel alive and motivated." 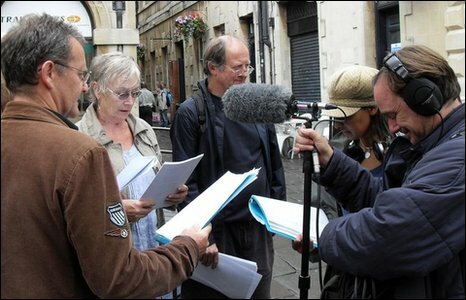 You will be able to listen to the episodes on the BBC Bristol website from Monday, 28 December 2009.